I'm in a group of prop replica fans on FB..... someone got a picture inside the A car recently which was cool. 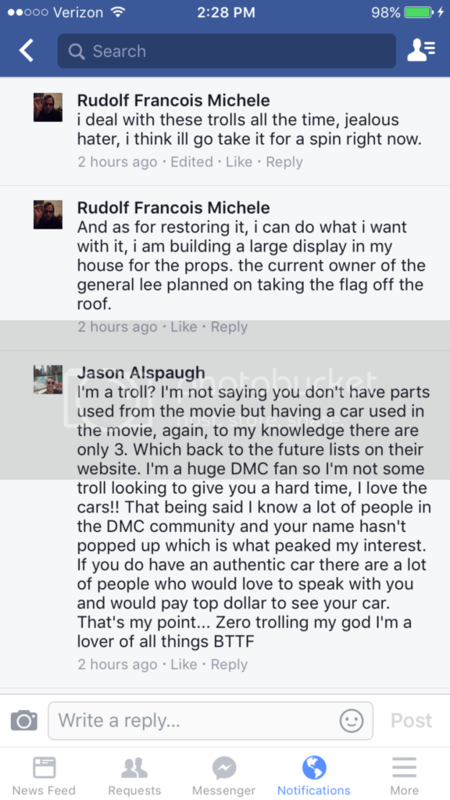 Anyways, in the comments a guy mentioned his buddy owned one of the cars used in the movie. My ears perked up as I am aware of only 3 that exist. He said it was used for the interior shots for the movie. Here is also an article where he claims it's the real deal. So..... what's the story behind this?? Um, no. The only screen used car in private possession (Mr. Shea's) and that is the Part 3 car. No Redford Theater on Future Day did not have a "Screen Used" Back to the Future Car. I was out at the Star on John R in Troy. Redford Theater is in Redford, not to far away from me. Scroll down on my page in my signature for pictures. 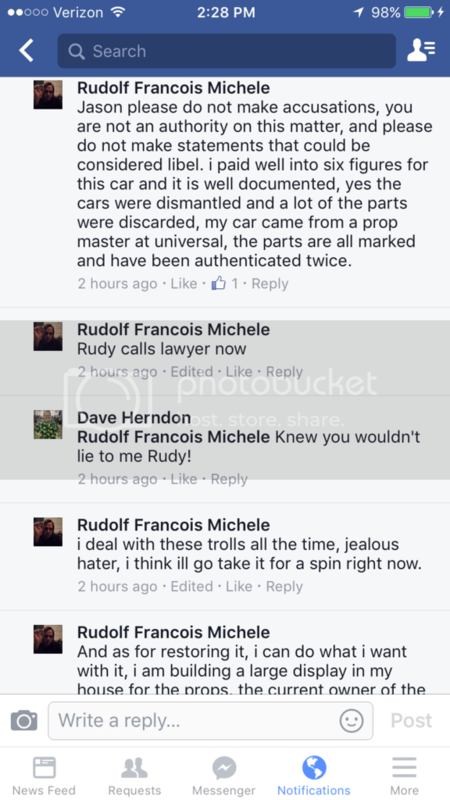 To which he replied " I paid well into six figures for this car and it is well documented, yes, the cars were dismantled and a lot of the parts were discarded, my car came from a prop master at universal, the parts are all marked and have been authenticated twice." It appears he might have some original parts used in the move and put in his own delorean. He seems like a nice enough guy, some kind of DJ or musician and said he is private which is why not many people know his name in the BTTF community. I certainly wasn't looking to troll the guy, just wanted to get some clarification. 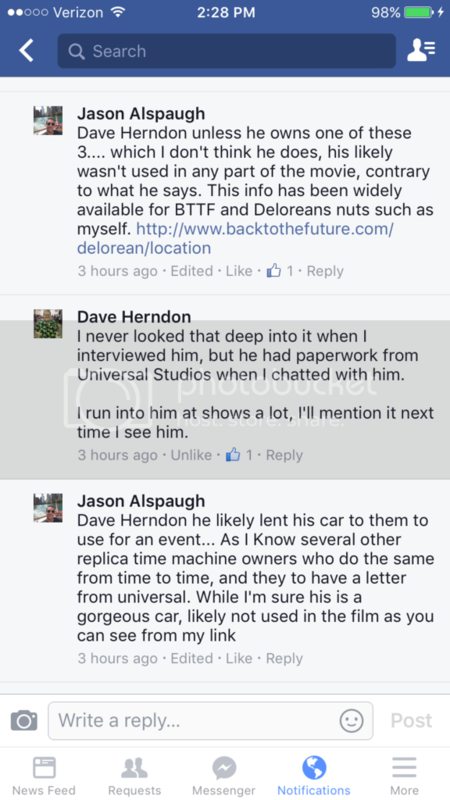 Being a huge BTTF fan, and knowing only 3 cars exist.... and someone claims theirs was used in the movie, I needed to hear his side of it. Certainly not resolved, I only have more questions now but I'm not going to bother the guy. But promoting a car as screen used certainly isn't the right way to go about things if it wasn't, basically my only point. He does have a nice DMC. Last edited by EngineerGuY; 08-11-2016 at 01:07 PM. Everyone assumes he’s a huge fan because he drives around in a DeLorean. But not just any model of the classic car, his was screen used for interior shots on the film trilogy. “I was looking for a DeLorean, it’s just coincidence that this was used in the movies,” he said. The DeLorean is definitely not screen used but it sounds like he may have some parts that might be? Could someone post a link to that facebook discussion that was mentioned? My roaming area this past weekend. Gratiot Cruise. I was all over the map. Redford is southwest of this picture. Color me interested as well. 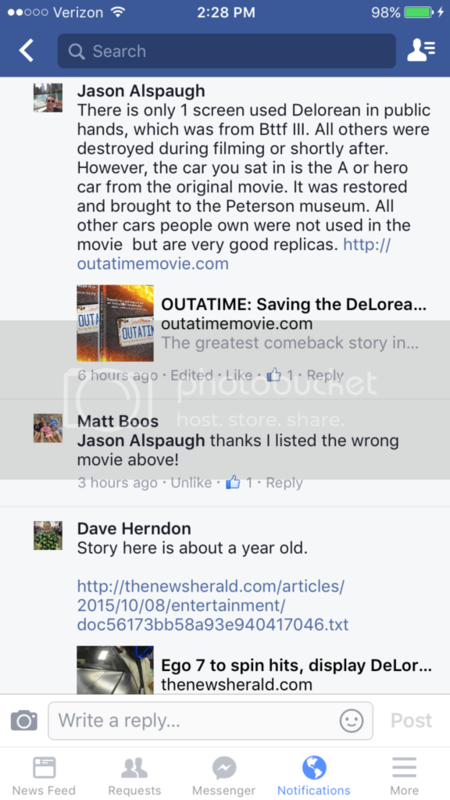 Was it on "Back to the Future Forever" page on FB? Last edited by aotmfilms; 08-11-2016 at 03:30 PM. Here is the link to the group..... "Vintage Toys and Action Figures"
Not to mention his handle is Ego7, and he's proud of it. I had a co-worker whose brother was working at a car storage in Beverly Hills and swore the converted Time machine replica they had was the original from the first movie. If I was a total jerk and liar, I could easily say "yes" every time I'm asked if mine was the one from "the movie", and it's not even a time machine. I think it being lowered with a spoiler makes people think it is. But I'm neither a liar or jerk (well, try not to be a jerk).. 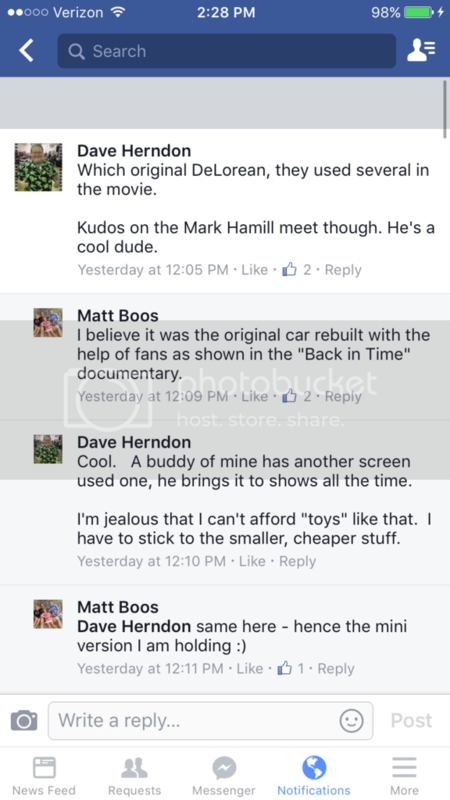 Here is the full convo from the guy stating his buddy owns one of the movie car, to the guy actually joining the convo. Last edited by EngineerGuY; 08-11-2016 at 03:44 PM.